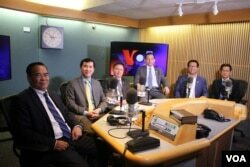 A group of former opposition lawmakers from the banned Cambodia National Rescue Party visited Washington last month to lobby U.S. Officials. The former lawmakers, led by the party’s former leader, Sam Rainsy, called on the United States to intervene against the government of Prime Minister Hun Sen.
Last month Cambodia banned the CNRP and distributed its seats among unelected members of minor parties that failed to win any seats at the last election. The ruling Cambodian People’s Party claimed CNRP officials, including Rainsy and the party’s current president, Kem Sokha, had plotted with Washington to overthrow Hun Sen. The opposition denied the claims, which were dismissed by the United States as baseless. But Sokha was arrested in September and charged with treason. 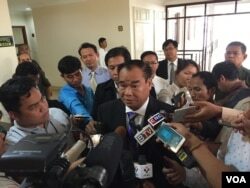 He awaits trial in Cambodia. The CNRP delegation in mid-November met with congressmen, including Alan Lowenthal and Steve Chabot, co-chairs of the Congressional Cambodia Caucus, and Senator Cory Gardner, chairman of the Senate Subcommittee on East Asia. The former parliamentarians were well-received and met with understanding, according to To Vanchan, one of the delegates. “I believe that it’s going to be effective on the government for what they’ve done to CNRP," he said. The crackdown on dissent in Cambodia has not been restricted to the opposition, with independent media outlets and civil society also targeted by a combination of lawsuits, false media reports propagated by pro-government websites and political pressure. Ho Vann, a former lawmaker for Phnom Penh, puts the blame solely on Hun Sen. “It’s because of Hun Sen, he alone has crushed our democracy,” he said. “We all regret it. We, both the party and people, are advocating for a democratic and legitimate leadership in Cambodia. This is what we have been fighting for in the past years. That's our purpose." The government’s claim that the CNRP conspired with the United States to foment a “color revolution” to overthrow Hun Sen rests on statement Sokha made years ago at a rally that he had been advised to “follow the Serbia model” by unnamed Americans and to establish a human rights group to lay the groundwork for an opposition political victory at the polls. The government also insinuated that the CNRP had tried to encourage violence in the aftermath of the disputed 2013 general election, when tens of thousands of Cambodians joined mass anti-government protests, leading to a violent crackdown ordered by Hun Sen, in January 2014, which left at least five dead. "In fact, we actively advocated for nonviolence,” said Vann. “Even though we used to protest, they were aimed at reforming the National Election Committee. That was our goal, not a ‘color revolution.’"
The opposition’s strategy is to call for international sanctions, to lobby for the release of Sokha and other political prisoners, and to pave the way for the CNRP to be allowed to contest the next election, scheduled for next year. So far, the United States, European Union, Australia and France have begun to apply pressure on Hun Sen’s government, according to one of the delegates. “This reaction is not going to go away,” said Eng Chhai Eang. "If Mr. Hun Sen does not back down, then they will take concrete action." Some proposed punitive actions include the removal of Cambodia from preferential trade initiatives. Cambodia relies heavily on the schemes for access to E.U. and U.S. Markets. Unions and employers have recently warned against such action, which they say would be unpopular with the hundreds of thousands of Cambodians who work in the country’s garment industry. Most of the CNRP’s former lawmakers have fled the country, fearing arrest. Phay Siphan, government spokesman, said it would be “impossible” for the CNRP lobbyists to achieve their aims. “Like throwing a rice husk against the wind,” he said.